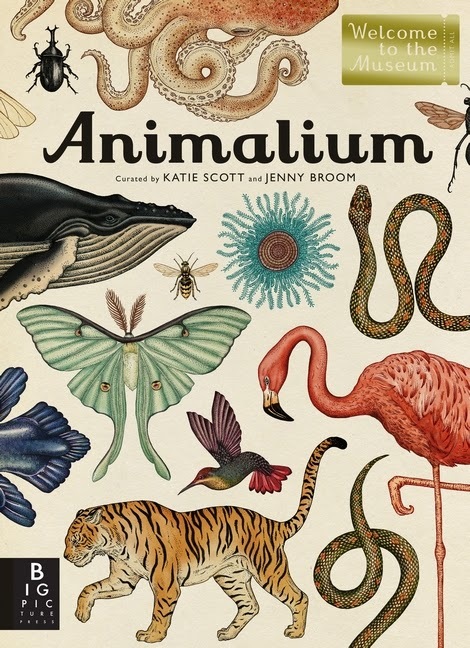 Animalium, curated by Katie Scott and Jenny Broom, is the newest, biggest book from the fantastic Big Picture Press and is the first in their "Welcome to the Museum" series of books. It has also made many "best of 2014" book lists. 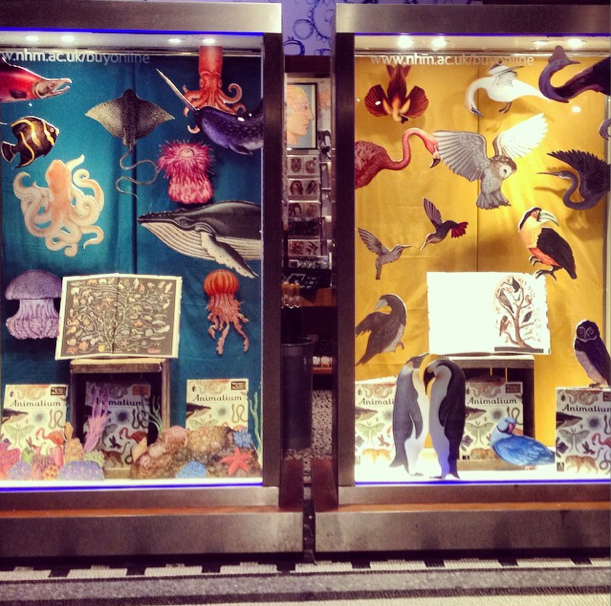 There are hundreds of books about animals out there for kids, but Animalium is set apart - and far above -from the rest because of the museum concept employed in this book. 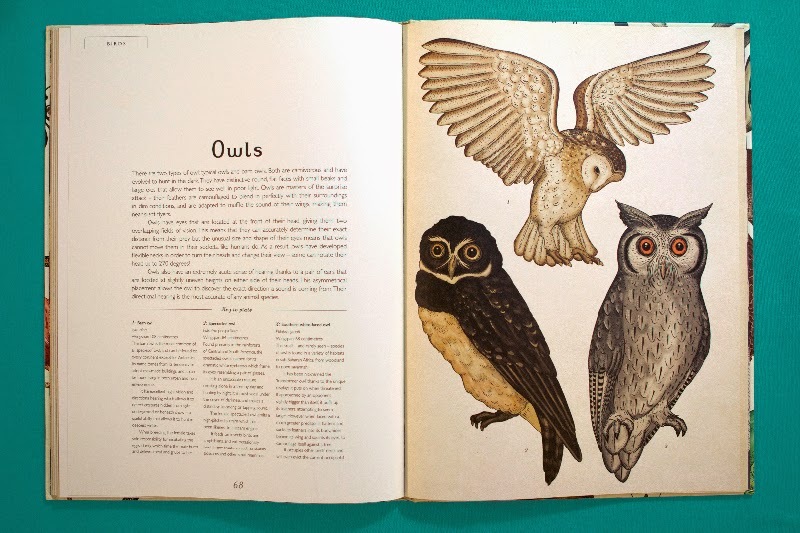 Honestly, regardless of the concept and text, Animalium is a book that you/kids will find yourselves poring over again and again. Eventually you will get around to reading the words . 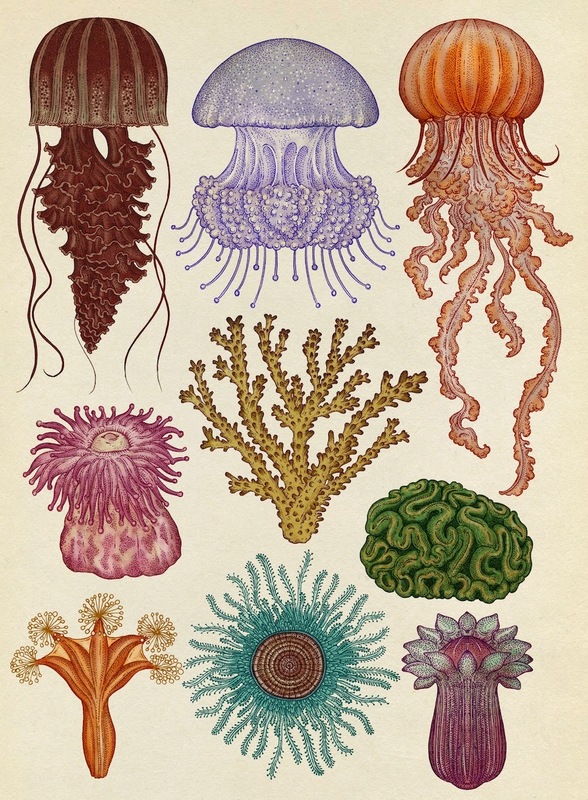 . .
Animalium begins with a preface from Dr. Sandra Knapp of the Natural History Museum in London, and moves on to the "Entrance." 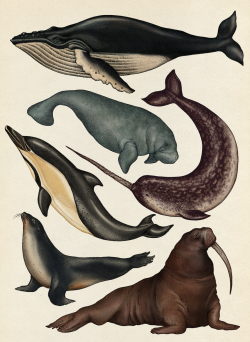 Here we learn that each chapter of Animalium "represents a different gallery of the museum, focusing on one class of animal" with the classes arranged in "evolutionary order to show how the animal kingdom has developed over time. See for yourself how the tree of life evolved from the simple sea sponge into the diverse array of animals found on Earth today." The illustration style looks like old engravings and lithographs but are actually pen and ink drawings that have been digitally colored. Animals are presented as above, with a paragraph of general information then keys to the plates and labels that add to the details, providing the Latin names and size. Animals are shown in their habitats museum style, under bell jars, which often makes you look at them and think about them in a new way. 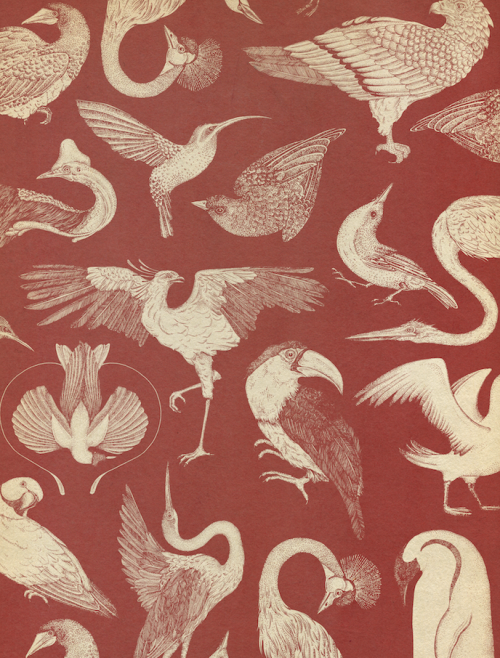 Endpapers and chapter dividers add to the museum feel as well as the idea of passing from gallery to gallery with the animals drawn in white on dark backgrounds. 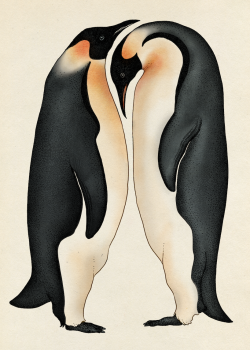 Of course, there is an index, followed by a short but solid list of resources for where readers can learn more about the animals seen in the museum and information on the "curators," both London based artists. 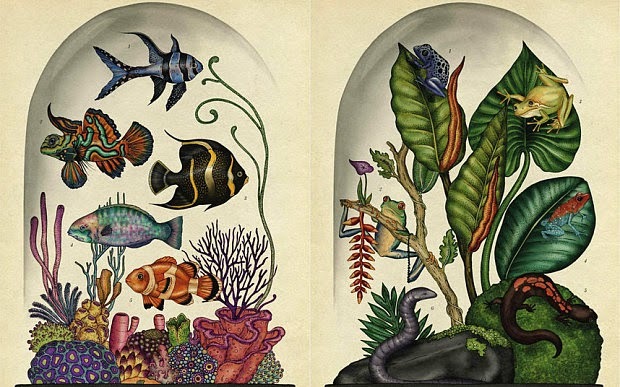 Animalium wowed me from the start, but repeated readings, especially while writing this review, reminded me of just how unique and completely absorbing this amazing book truly is. 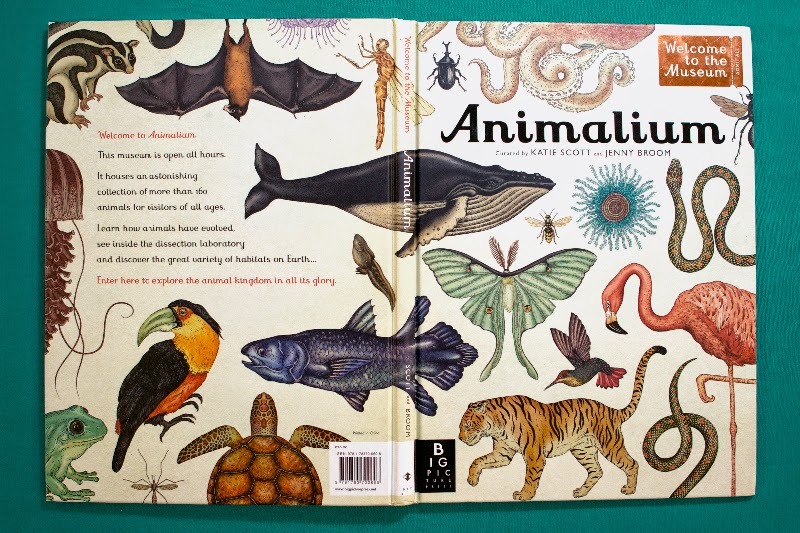 Animalium is the kind of book that is perfect for almost any gift giving occasion - it will engage kids the minute they open the cover and impress parents, who will most likely end up poring over it as well. 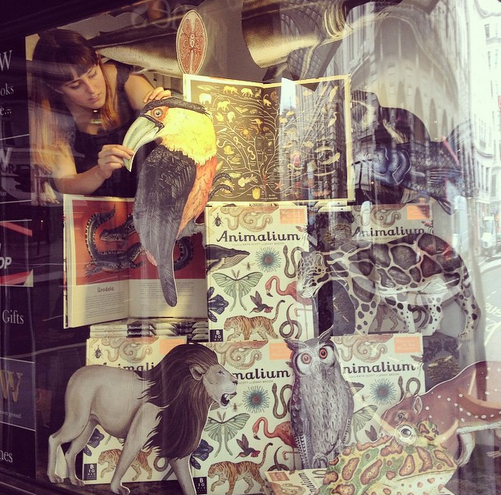 The illustrations are so amazing, I just had to include a few more here along with photos of window displays Katie Scott created for the book at Waterstone's and the Natural History Museum in London!